A good flashlight is essential in any home, emergency kit, or backpack. You never know when you may need some extra light, and having a dependable, bright light on hand can save you a lot of time and trouble. With so many flashlights available, it can be difficult narrowing down which one to purchase. Do you need a tactical model, or are you better off with a portable light that fits easily in your pocket? We took a look at several different categories, and identified the very best for a variety of situations and uses. Read more about our methodology. This portable and versatile flashlight offers a lot of functionality in a small package. 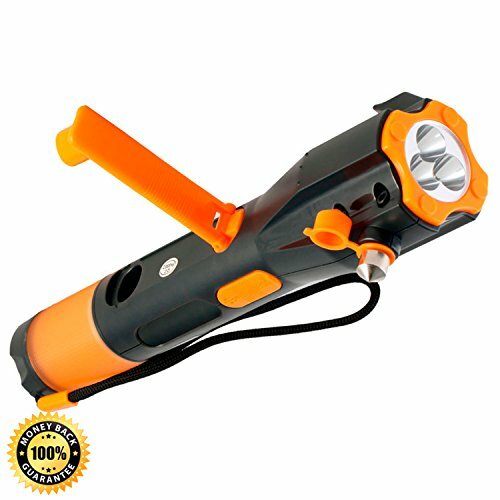 With multiple lighting modes, waterproof aluminum construction, and an incredible bright, zoomable beam, this is a perfect flashlight for camping, toolboxes, and roadside emergencies. This compact flashlight is way beyond others in this price range. For under $10, you get a flashlight with multiple lighting modes, adjustable focus, and the heavy duty metal construction you’d expect from a light that costs twice as much. Our favorite tactical flashlight is loaded with useful features, including two lighting modes to switch between outdoor and tactical use, a 1000-lumen LED that offers turbo and strobe modes, and a rugged design that can withstand heavy use and impact. This practical and affordable headlamp is ideal if you need a light source that keeps your hands free. With multiple light settings and a comfortable, adjustable strap, this should be your go-to headlamp for cycling, camping, or working on a vehicle. Our favorite pocket-flashlight packs a powerful LED light into a compact, well-built package. It offers multiple lighting modes, adjustable focus, and long battery life, and best of all, it’s rechargeable using an included Micro USB cable, so it’s always ready when you need it. Our favorite handheld lantern is excellent for working in a dark area or spending time outdoors. It offers a dependable light source and an extremely handy, adjustable integrated stand that lets you point the beam exactly where you need it. A dependable emergency flashlight is a must-have in your vehicle or home. This hand-crank flashlight provides bright light when you need it, along with features like a seatbelt cutter and USB charger to provide even more help in an emergency. Increasingly, flashlight manufacturers are switching to LED lights, which provide solid illumination while consuming a fraction of the energy used by traditional bulbs. You can still find incandescent flashlights out there, but LEDs are generally a better bet: they last longer, provide more dependable light, and won’t suddenly go out if you drop your light. This is perhaps the most important consideration when choosing a flashlight. Do you want the blindingly-bright, focused beam of a tactical flashlight, or do you need a source of more diffused light? Depending on how you’re planning to use your flashlight, you may not need a model that offers 1,000 lumens, since it may be overkill. If you’re looking for a flashlight to add to your toolbox or emergency kit, this is not much of an issue, but many larger flashlights are simply too heavy and impractical to carry with you. Since so many flashlights now use LEDs and require less power as a result, you can now find portable lights that offer similar specs as bulkier models. A broken flashlight is, in many cases, worse than having no flashlight at all. You want a flashlight that is going to work every single time you need it, so it’s worth taking some time to find a dependable flashlight with a long-lasting battery. Alternately, you’ll want a light that uses common batteries that you can easily swap out if you need to. Closely related to dependability, a flashlight’s materials and construction are another big consideration. You may want a waterproof flashlight, for example, if you expect to use it in adverse weather or damp locations. If you want a flashlight that can’t be easily damaged, you should look for one made of shock-resistant materials. Flashlights are available at virtually any price point, from a $5 pocket model to searchlights that easily cost hundreds of dollars. You can buy a flashlight that costs less than $10, but many of the lights you may find at this price point can fail when you need them the most. They’re simply not designed for rigorous use, so it’s worth paying a little extra for a light that’s going to work more reliably. That’s not to say there are no high-quality flashlights on the lower end of the price range: our budget pick, in fact, costs less than $10 and performs exceptionally well. In general, if you’re looking for a dependable light you can carry with you or use in case of an emergency, you can expect to spend between $15 and $30. Tactical models, which incorporate extra features and a resilient design, are generally more expensive. The majority of tactical flashlights cost between $50 and $100, but they tend to be extremely well built and will withstand heavy use. 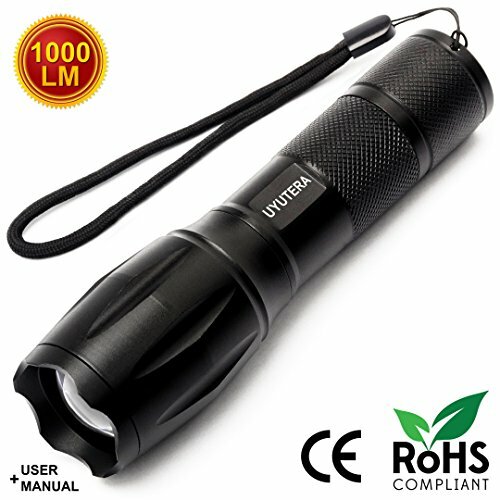 The Uyutera Waterproof LED Flashlight packs a lot of advanced features into a flashlight that’s easy to carry wherever you go. With a 1000-lumen LED light that can be zoomed in to focus, as well as multiple lighting modes to provide even more versatility, this is a great light to toss in your backpack or vehicle. 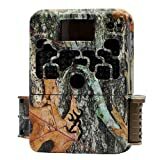 We also loved its comfortable grip, waterproof construction, and lightweight design. Multiple lighting modes. This flashlight has a really bright default setting, so the ability to quickly adjust to 25% or 50% brightness definitely comes in handy. The strobe setting and SOS mode will definitely help out in an emergency. Waterproof design. The Uyutera light is made of high-quality aluminum alloy, which provides a ton of protection against water and corrosion. Considering you frequently need a flashlight in wet conditions, this is a major selling point. Portability. For as powerful as it is, this flashlight is a very convenient size. It fits well in a backpack or purse, and can also be stowed in a glove compartment or car emergency kit for when you need bright light on the road. Zoomable focus. We also liked the ability to widen or focus the beam when using this flashlight. This provides a lot of added versatility, especially if you’re using the flashlight to view a larger area but still need bright light. Batteries not included. This light requires 3 AAA batteries, but unfortunately it doesn’t ship with any included. This definitely isn’t a deal-breaker, especially considering the price point, but it would be nice if you could immediately use it out of the box. The Onete T6-D LED Flashlight is one of our favorite budget-friendly flashlights. Usually, flashlights that cost less than $10 are made of cheap plastic and don’t offer much in the way of features, but this water-resistant, metal flashlight has a strobe mode and adjustable focus. Added features like a bottle opener and luminous ring aren’t necessarily selling points, but they do show how this light goes above and beyond its competitors. Bright, adjustable light. The Onete T6-D uses an LED bulb to provide a very bright, steady stream of light. It’s very easy to adjust from a wide area to a narrow beam, which makes it a great tool for a variety of situations. Heavy-duty design. 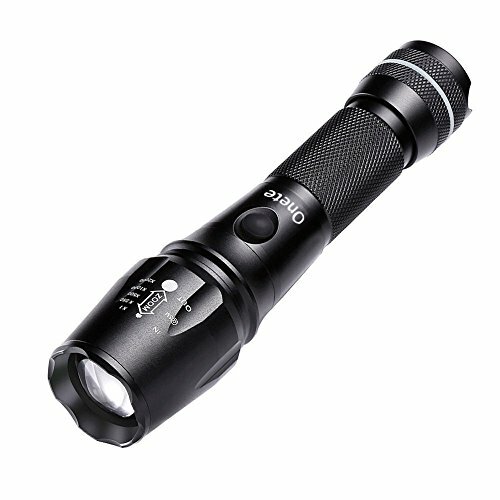 This is an incredibly well-constructed flashlight, especially compared to other models in a similar price range. It’s made of impact- and water-resistant metal that won’t corrode or easily wear out. Pocket sized. If you’re looking for a flashlight to carry with you throughout the day, the Onete is an excellent choice. It’s not overly bulky, and doesn’t have any oversized parts that might get stuck in a pocket or bag. Batteries sold separately. At this price point it’s not surprising that the Onete doesn’t include the necessary AAA batteries, but having to buy them separately does mean you’ll have to spend a few extra dollars. Focused beam could be better. When it’s all the way focused, the beam on this light leaves something to be desired. If you need a focused, precise beam of light, this probably isn’t the best choice. Designed for use in law enforcement and combat situations, tactical flashlights are some of the brightest and most reliable flashlights available. While many police and security officers carry tactical flashlights in conjunction with firearms, these heavy-duty lights are also popular within the “everyday carry” community. Tactical flashlights tend to offer an incredibly bright, focused beam of light that can disorient would-be attackers, and most models are shock-resistant and feature powerful, long-lasting batteries and lightweight construction. The Fenix FX-PD35TAC is a sturdy and practical flashlight, whether you’re using it in the line of duty or simply carrying with you throughout the day. We particularly like the ability to toggle between two lighting modes: tactical mode lets you quickly operate turbo and strobe modes via the flashlight’s tail switch, while outdoor mode activates the side switch, giving you a lot of versatility depending on how you’re carrying and using the light. Multi-mode operation. The ability to toggle between outdoor and tactical modes gives the Fenix FX-PD35TAC a lot of versatility. In tactical mode, the tail button allows you to quickly switch between turbo and strobe mode, while the outdoor mode keeps the controls on the side so you can hold the light in front of you. Rugged construction. This is a really well-built flashlight, made of heavy-duty materials that resist scratches and dents and keep the flashlight working even if you drop it. The added heft may also be useful if you need to use the light to fight off an assailant. Incredibly bright light. With a 1000-lumen LED, the Fenix puts out a lot of light. In turbo and strobe modes, it’s bright enough to disorient or temporarily blind any would-be attackers. Integrated holster and clip. While they’re not the primary selling points, we really liked the included holster and clip. Both make it really easy to keep the light close at hand when you’re not using it. Quickly runs through batteries. One major issue with this flashlight is that it eats batteries. On turbo mode, even powerful rechargeable batteries will run out of power in about an hour. Broad beam. While the Fenix does feature an extremely bright light, it does have a broad beam that could be an issue if you’re looking for a precisely-focused light. Whether you’re cycling, working, or walking the dog, sometimes you just need both hands free. Headlamps are very convenient when you need illumination, but don’t want to have to carry a flashlight in one of your hands. 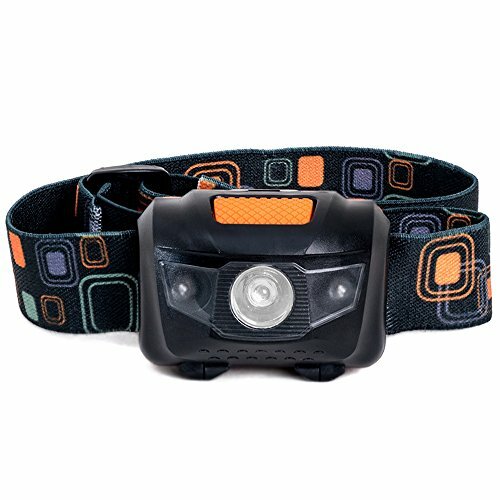 The best headlamps will balance bright light with comfortable and reliable straps to keep the lamp in place. For the most part, headlamps will use LEDs for illumination, keeping the design lightweight and running for a long while on a single charge. The Shining Buddy LED Headlamp is a surprisingly versatile and feature-rich headlamp, especially considering its price point. It offers multiple lighting settings, including bright and low modes and a red light for when you’re just looking for visibility. It’s also comfortable enough for long-term wear, which is perfect if you’re working on a vehicle, walking the dog at night, or going out for an evening bike ride. Water-resistant design. The Shining Buddy headlamp offers a really surprising amount of water resistance. Even in a heavy downpour, it works without interruption, and the strap dries out quickly so it won’t cause any discomfort or chafing. Comfortable strap. Since you’ll probably be wearing this headlamp for an extended period of time, having a comfortable strap is very important. The Shining Buddy’s strap adjust to fits both adults and children, and stays comfortable and in place for hours. Multiple lighting modes. If you’re planning on using the Shining Buddy for nighttime hikes or rides, the multiple lighting settings are excellent. You can quickly switch between a high- and low-powered beam, or use the red light to make sure motorists or fellow riders can see you. 45 Degree Tilt. The lamp on the Shining Buddy only tilts down 45 degrees, which can make it uncomfortable if you need it to illuminate something you’re holding on your lap or a workbench. Older LED Type. This headlamp doesn’t use the cutting-edge LED technology that you’ll find on some of the top-of-the-line flashlights. The LED is only 110 lumens, and the light has the blue tint of older LEDs. A convenient pocket flashlight is an absolutely essential and extremely versatile tool, and can save you a lot of time and trouble. If you walk around at night or arrive at your front door after dark, having a pocket flashlight can keep you safe and help you find the right key. A small, bright flashlight can also be a big help if you’re working around the house and need to illuminate an area where a full-sized flashlight just can’t fit. 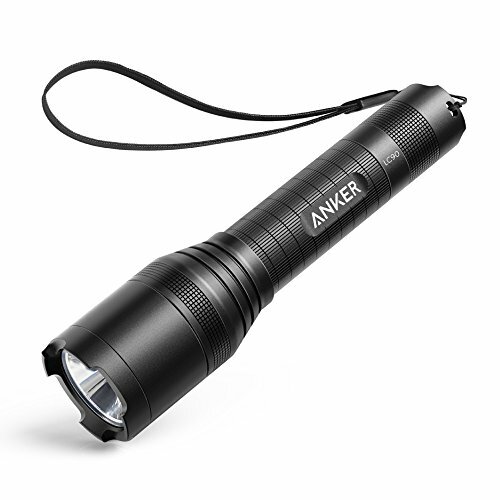 The Anker Bolder LC90 LED Flashlight is one of our favorite compact flashlight models. It’s a little bit more expensive than other pocket-sized flashlights, but for the extra investment you get a lot of high-end features and sturdy metal construction. The fact that it’s easily rechargeable is one of this flashlight’s biggest selling points, along with the long-lasting battery and multiple lighting modes. Rechargeable battery. If you use a flashlight every day, you may find yourself going through batteries much faster than you’d like. The Anker Bolder solves this problem with an integrated battery that fully recharges in just a few hours. Bright, steady light. The Anker Bolder features a 900-lumen LED light, which is fully adjustable so that you can easily switch from a wide beam to a precise point of light. Solid construction. 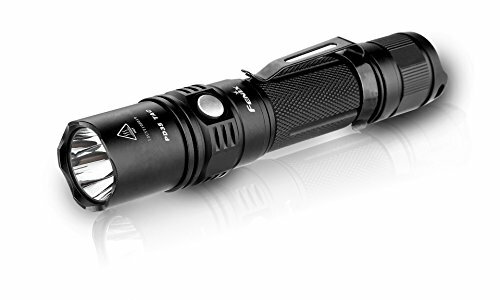 This is a really well-built flashlight, and it will definitely hold up to everyday use. The design also resists water, which adds an extra level of durability and dependability. On the heavy side. For a pocket flashlight, the Anker Bolder is a little bit heavier than some users might like. This is mostly due to the metal construction, but it does add a noticeable amount of weight in your pocket. Anti-slip grip is not ideal. Although it boasts an anti-slip grip, we found that the Anker Bolder could easily slide out of your hand, particularly in wet weather. This is one area where the design could really be improved. If you’re looking for a bright light to illuminate a large area, a handheld lantern may be your best bet. While most handheld lanterns won’t have the narrow beam or focus of a tactical or pocket light, they can provide a lot of ambient light in a dark area. The best handheld lanterns also offer durable construction that can withstand the elements, making them perfect for camping or searching outdoors at night. If you need a larger, heavy-duty lantern for camping or jobsite illumination, the Dorcy 41-4291 is a reliable and practical choice. While it’s not the brightest flashlight, it offers long battery life and can withstand a lot of heavy use. One of our favorite features is the integrated stand, which is excellent for positioning the light and keeping your hands free. Long battery life. 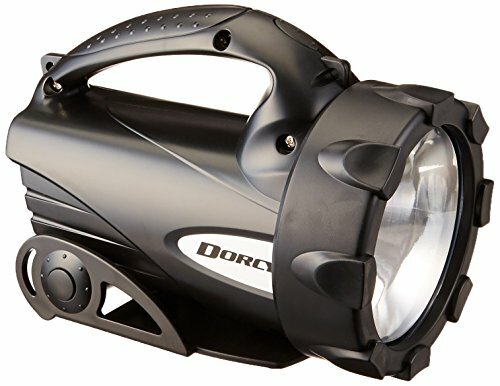 The Dorcy lantern uses either 4 D batteries or a single 6V lantern battery. Either way, it lasts for a very long time before needing new batteries, which is perfect if you’re working in a dark area and need hours of illumination. Rugged design. This flashlight can definitely take a beating, which is another great feature if you’re using this on a jobsite or setting it up outside during a camping trip. Adjustable stand. Our favorite feature of the Dorcy 41-4291 is the integrated stand. It’s a foot on a ratcheting swivel, which can be set on the floor or ground and will stay in place while you point the light wherever you need it. This is a useful, practical feature that just doesn’t exist on other similar models. Not Very Bright. Unfortunately, the light on this handheld lantern is not as bright as it could be. While it advertises a 300-lumen light, the output is significantly lower, which some users might find too dim. There are many times when you need a flashlight, but find that you don’t have a battery ready to go. Power outages, vehicle breakdowns, and camping trips can all lead to situations where you may need an emergency flashlight. Many of these models are designed with a number of emergency tools like a seatbelt cutter, window breaker, and compass, and most feature a hand-crank to charge the battery when you need light on the go. The Cynergy Lifelight Waterproof Rechargeable Crank Flashlight is one of the most versatile emergency flashlights on the market, balancing a bright, reliable light with a handful of emergency features that can provide a lot of help during a breakdown or power outage. The hand-crank powers it up very quickly, while the impact-resistant and waterproof design is ideal for severe weather and outdoor use. Easy-to-use crank. While most emergency flashlights offer a hand-crank for emergency power, the Cynergy Lifelight’s crank is much easier to use and provides power much more quickly than its competitors. Added emergency features. This flashlight is loaded with extra features, including a seatbelt cutter, window glass breaker, compass, and USB charger. This makes it a very handy tool in an emergency, whether you’re at home or in a vehicle. Solid construction. Because it’s made of impact-resistant, waterproof plastic, the Cynergy Lifelight can easily withstand falls or adverse weather. This is particularly important for an emergency light, since you’ll likely need it during storms, flooding, or other less-than-ideal conditions. Larger size. If there’s one shortcoming with the Cynergy Lifelight, it’s the larger size. This is mostly an issue if you’re hoping for an emergency light that you can stow in your dashboard or console, since it will eat up a lot of space.